This summer has offered few moments for the landscape photographer to rejoice at the quality of the light. Too much cloud….not enough cloud……. It’s not as if I’m choosy or anything. Last Wednesday was a case in point. The promised morning clearance came a little too late, and left a residue of extensive sheets of high-level white cirrus, rather than the blue sky that one expects. But late in the afternoon things really did take a turn for the better: the cirrus became more wispy and a big patch of blue sky was revealed. And I was in the perfect position to take advantage of it. This viewpoint over the Dyfi valley has become rather a favourite of mine recently. 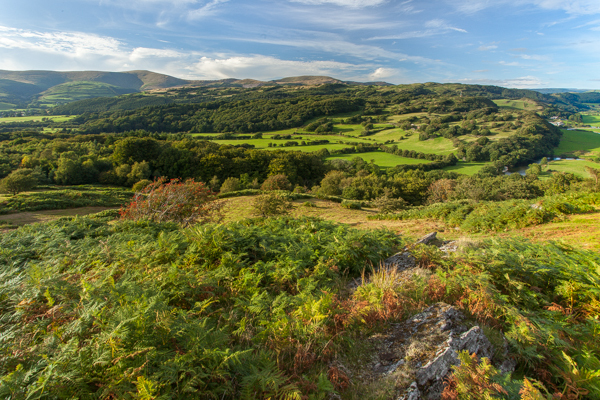 It has great views to the Snowdonia National Park to the north. With such a commanding position it is also a great spot to spend the night or sit and wait for an improvement in conditions. And when that happens one is right on the spot. It took me a while to find some foreground interest for this “big”, almost panoramic, landscape. A small rocky outcrop did the trick though, and the colourful autumnal tones of the bracken fronds and mountain ash tree were also helpful. To fit it all in, though, I needed to use the wide end of my wide-angle zoom, which added its own problems. Using a polarising filter on a lens as wide as 17mm nearly always leads to visible uneven polarisation. This results in a dark blue, over-saturated patch of sky at the top of the image – in the centre if you are at right angles to the sun. If – as I do – you add a graduated neutral density filter the patch will tend to be greyish-blue, which is most unattractive. And yet a polariser is so critical for this type of image. Until this morning I really didn’t know how to solve this problem. Back at base I had tried cloning the dark patch out and replacing it with another area of sky, but this was hopelessly crude with a complex sky like this. Then I came across the radial filter – a new feature of Lightroom v5, but not one for which I had expected to find a use. I decided to have a quick play, and suddenly it all came together. I selected the dark patch with the radial filter, altered its dimensions so it fitted reasonably well, and feathered it to 100%. Finally I inverted the mask so that I could work only on the area within the selection. It was then a matter of using trial and error with the exposure, highlights, shadows and saturation sliders to get the natural result I was looking for. Very definitely a eureka moment! Postscript: after further experimentation I’ve come to the conclusion that adjusting the contrast is probably the most useful in this situation. Lowering the saturation results in the blue becoming greyer. This entry was posted in Uncategorized and tagged lightroom 5, polarising filter. wide-angle lens, radial filter, uneven polarisation. Bookmark the permalink.